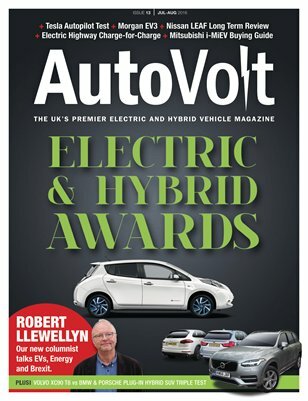 Main features are: 2016 AUTOVOLT EV & HYBRID AWARDS COLUMN: Robert Llewellyn on energy and EVs. INSIGHT: Charge For Charge. Ecotricity introduces a fee to use the Electric Highway. DRIVEN: Tesla and the Autopilot. FEATURE: SUV Triple Test. Volvo XC90 T8 vs BMW X5 xDrive40e vs Porsche Cayenne S E-Hybrid FEATURE: Morgan EV3. LONG TERM: Nissan Leaf 30kWh. TECHNOLOGY: Formula E Battery. BUYING GUIDE: Mitsubishi i-MiEV.